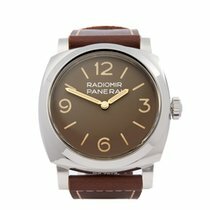 This is a pre-owned Panerai Radiomir marina militare gents PAM00587 watch. 47mm case size in stainless steel, black baton dial on a brown leather bracelet, powered by a mechanical wind movement. 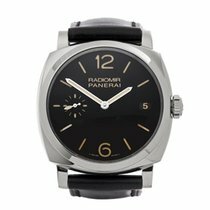 This Panerai is in excellent condition complete with box, manuals & open guarantee. Circa 2010. Our Xupes reference is W4035 should you need to quote this. THIS WATCH IS UNDER OFFER FOR A LIMITED TIME.